Medicare is our US Government health insurance program which is primarily for people age 65 or older (exceptions for disabilities and etc). If you are among the many Baby Boomers who are about to turn 65, you need to start thinking and learning about Medicare Benefits. You will become eligible for Medicare as soon as you turn 65. If you delay enrolling, it may result in penalties. Part A: Covers hospital stays. Helps to pay for inpatient care in a hospital or skilled nursing facility (following a hospital stay), some home health care and hospice care. Part B: Covers Physician Fees. Helps to pay for doctors’ services and many other medical services and supplies that are not covered by hospital insurance. 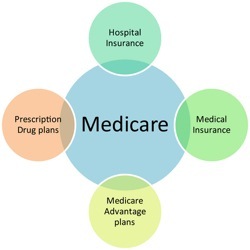 Part C: Medicare Advantage – permits Medicare beneficiaries to receive their medical care from several delivery options. People with Medicare Parts A and B can choose to receive all of their health care services through one of these provider organizations under Part C.
Part D: Covers prescription medications. Help to pay for medications doctors prescribe for treatment. Initial enrollment for Medicare (Part A & B) begins 3 months prior to your 65th birthday and continues for 7 months.﻿ ﻿To enroll, you must call the Social Security Office at﻿ ﻿1-800-MEDICARE, ﻿﻿or go to﻿﻿ ﻿http://www.ssa.gov/pgm/medicare.htm﻿ ﻿﻿to sign up online.﻿.﻿ For those individuals currently receiving Social Security, you are automatically enrolled in medicare Parts A & B in your 65th birth month. If you do not enroll in Medicare Part B during the initial enrollment period, sign up is available during a “general enrollment period” from January 1 through March 31. Coverage begins on July 1 of the year you enroll. Be warned that your monthly premium increases 10 percent for each 12-month period you were eligible, but fail to enroll in Medicare Part B.
Medigap policies can provide additional coverage for individuals enrolled in Parts A & B. With all the deductibles, co-payments and coverage exclusions, Medicare pays for only about half of your medical expenses. The remaining balance not covered by Medicare can be mostly covered with so-called “Medigap” insurance which is provided by private insurers.